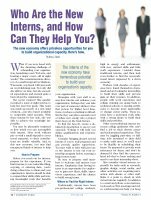 Home > Membership > Nonprofit World > Who Are the New Interns, and How Can They Help You? Who Are the New Interns, and How Can They Help You? The new economy offers priceless opportunities for you to build organizational capacity. Here's how.